Question: Is it obligated on a woman to keep the ties of kinship? Can you clarify this for us and may Allaah reward you. After your mother and father, those who are closest to you are your children, blood brothers and sisters, uncles (or aunts) and cousins. And whenever a person is closer to you as a relative, he (or she) is entitled to more rights from you. 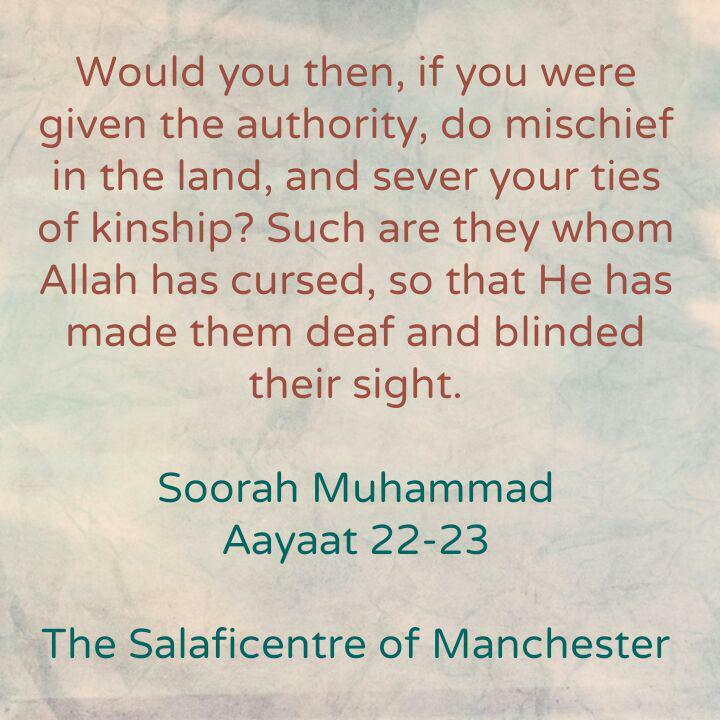 Keeping the ties of kinship should be established in accordance with one’s ability, so if your relatives live with you in the same country or close by, it is obligatory to visit them, honour them, show them kindness and assist them if they are in need. Written correspondence and other means of communication, such as telephones and other modern means of communication are all good means through which close contact can established between many people living far away from each other. Therefore, it is obligated on a person to use them for what will make a person get close to Allaah by keeping the ties of kinship.